It seems that all over the web, there's a growing number of people who think that copyright is a bad thing. 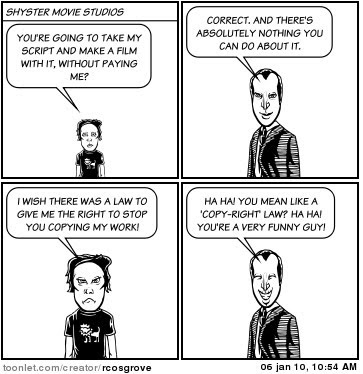 A few years back this was limited to the copyleft movement and filesharers (or pirates if you prefer), but lately it seems that more people in the creative industries and artists seem to view copyright as a bad thing - mainly that it allows large corporations to exploit individuals. 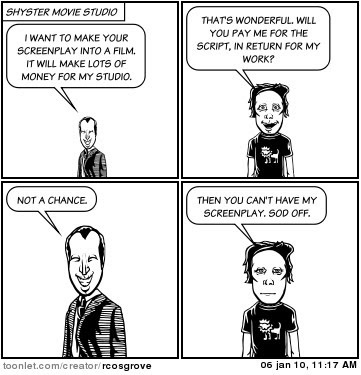 Worse, some take the view that acknowledging the rights of other creative professionals is optional. This is disturbing because copyright exists to protect artists and creatives from being exploited. These aren't a set of perfect laws, and they're open to abuse, but they enable workers in media to earn a living. Now, the same scene in the real(ish) world. People who work in creative professions have the right to be paid, and the right to be credited as being the creator of their work, because of copyright laws. Businesses also have the right to stop people copying products they've developed. This enables creatives in any field to earn a living, as well as enabling companies earn the money to employ staff and invest in new works. Abuse and manipulation of copyright laws by businesses and individuals should be stopped. But destroying, or just plain ignoring, copyright laws isn't the way to do it.